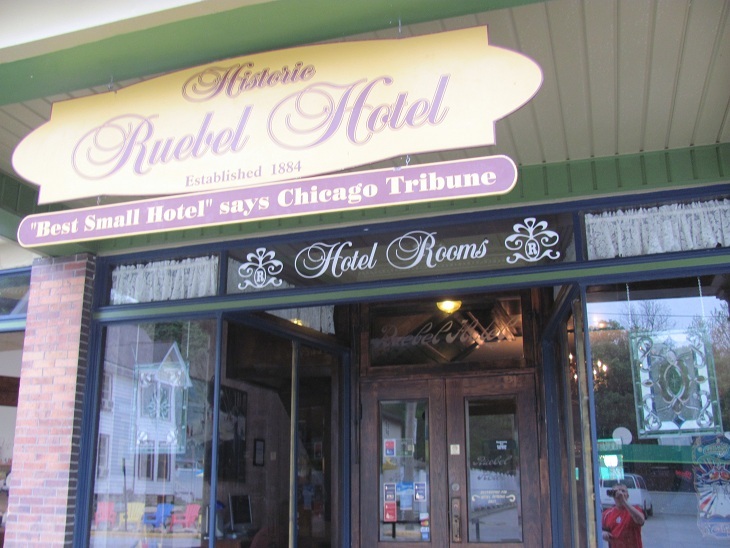 The Ruebel Hotel, built in 1884 in the river town of Grafton IL, has been on our list of establishments to investigate for several months now, so we decided to do it on this beautiful Wednesday night in April. It turned out to be a great night to go, since only 4 rooms in the entire hotel were occupied. We also had the opportunity to talk with the owner Mo in great length about the hotel, and he was more than eager to share his stories with us! The most famous spirit of the hotel, is of course, that of a young girl named Abigail who has been most frequently seen at the top of the staircase and has been heard laughing in the middle of the night. We were not able to ascertain however who Abigail may be. Mo told us he would come to work in the morning, and would find cabinet doors open in the bar, which he had closed himself the night before. Having been the last person out and the first person to enter in the morning, he could not explain it. He lived in the building for a while and would hear footsteps when no one else was in the building. Lights would go on and off in the bar from time to time. He told us he has seen strange light anomalies on the security cameras, which ran all night. A recent guest had an overpowering smell of rose pedals in her room one night. Mo told us of a shadow figure which was captured on camera in the Banquet Room downstairs by a Paranormal group on an investigation a couple of years ago. 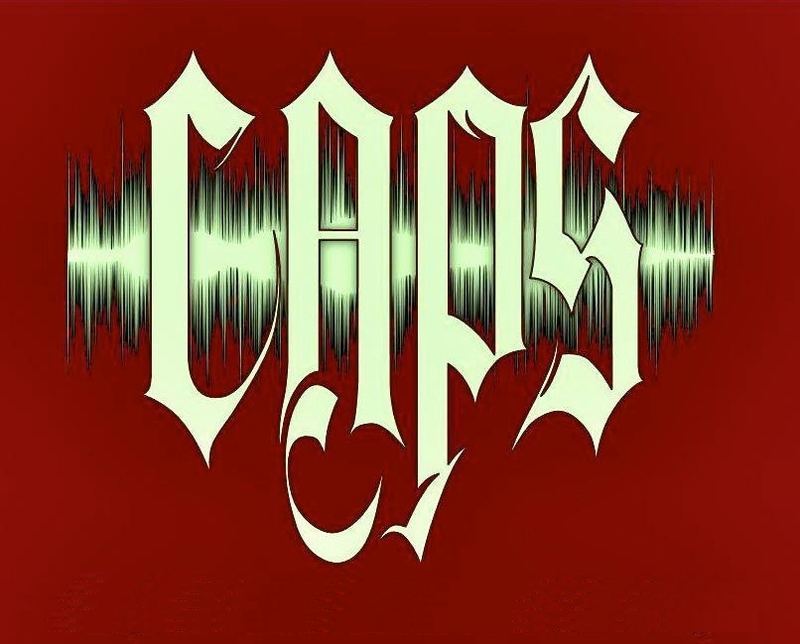 He also told us he had heard some intriguing EVPs the group out of Chicago had recorded during their investigation. Trish and I requested the room with the most activity and we were granted Room 9, the Ruebel Room, by management. Upon walking in the room Trish immediately heard a whisper, plain as day, but could not make out what it said and unfortunately we had not turned our recorder on yet. It was not the only voice she heard that evening. Throughout the night and next morning we heard loud noises in the room of which we could not find the source. The loudest was around 5:15am, which actually woke Trish up. Interestingly while eating breakfast in which Mo provided for his guests, a woman said she had a very loud knock on her door in room 19, known as the Grey Eagle Room, at 2am in the morning, and of course no one was there! I did manage to pick up several noises on the video camera that I had running for a few hours during the night, but nothing that could be considered proof of any kind of activity. There were random banging noises, at one point sounded like something was being dragged, and some very light voices. The most baffling event was definitely upon returning to our room after breakfast. I walked into room 9 and smelled an intense fragrance of men's cologne. I figured that the cologne I had brought probably spilled somewhere in the room, even though I had not used it during our stay. I then realized the bag with my cologne was in the car. The smell dissipated rather quickly and we did not pick up on it again. We enjoyed our stay at the hotel and the great lengths that Mo took to ensure his guests a pleasant stay. 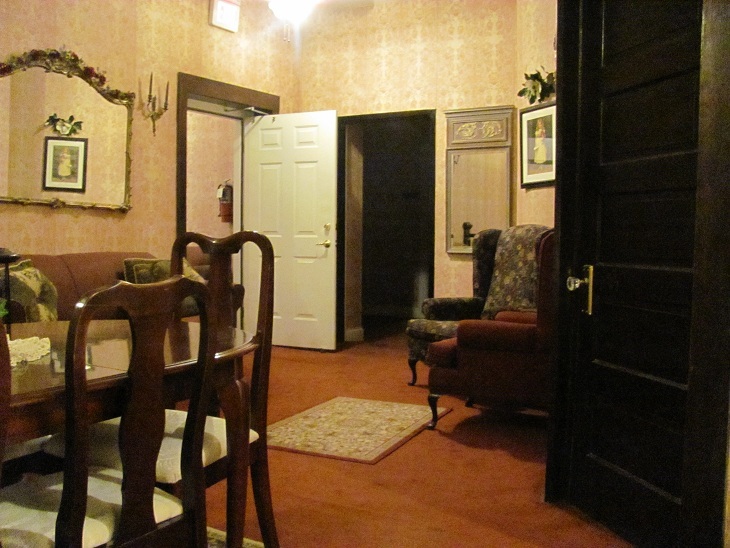 He is very open to the paranormal and people interested in investigating his historic hotel. I would definitely recommend staying during a weeknight during the off-season for those wanting to investigate. The size of the hotel and the way the noise travels would not be conducive to paranormal investigating with a large group. Thanks Mo, we will return soon! Think this one seems to say,"I'm...Susan", then later a different voice seems to say something like, "Please be quiet" (or is it Peace and Quiet). Captured this male voice upstairs, "Visit with me"